The slugs are in the class Gastropoda in the phylum Mollusca, for more pages in the phylum click on the left. Most slugs do not have a shell, but some have a small, visible shell, some others have just a few grains of shell located under the mantle. 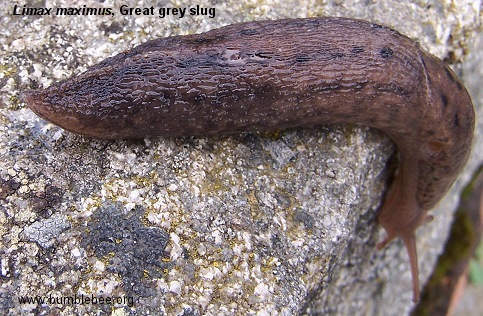 Slugs need moisture, so are more active at night or in rainy weather. When it is dry during the day they can be found under stones and logs, in leaf litter and around the base of plants. Some species dig themselves in quite deeply during a dry spell. There are around 30 species of slug un the U. K.
The slug body consists almost entirely of the foot (see below). The foot fringe circles the upper edge of the foot, and is marked by a continuous groove. They breathe through the pneumostome, which is the external opening of the lung on the right side of the body in most slugs, and the left in just a few. It can be clearly seen in the photographs and drawing below. The keel, when present, is a raised edge on the midline of the body. The mantle is a flap of skin and tissue covering part of the body, and enclosing the lung. Mucus and slime is exuded by the foot and the body. The two may differ in colour and consistency. Slugs have 2 pairs of tentacles; the upper pair have eye spots at the tip. Gardeners may want to read this sitting down. One keen Hertfordshire gardener spent 30 minutes every week removing slugs from his garden. In one year he removed over 16,000 of them. The next year they were just as abundant. However, although there are 30 species in the U. K., only 4 species do any real damage to living plants. Probably the most common British slug is Agriolimax reticulatus, sometimes named Deroceras reticulatum, the netted slug or grey field slug. It is a pale buff or cream colour with brown blotches, and has milky-white mucus. It is the slug which does the most damage in the garden. When it is contracted its body is almost dome-shaped. It usually mates on the soil surface early in the morning or late in the evening. Then between 5 & 20 days later the eggs are laid. There are 10 - 50 pearly-white eggs in a batch, and they are laid in the soil, under a stone or under some other suitable surface. The egg laying nearly always takes place at night. Eggs can be laid throughout the year, but tend to be rarer and fewer in number during the winter. Several batches of eggs can be laid from one mating, but the first batch contains the most eggs, and the number decreases with each following batch. The time taken before the eggs hatch depends largely on temperature - around a month being the average. The young slugs are just smaller versions of the parent, and reach maturity after 3 months to a year. The average life span is around 18 months. And as gardeners will know, they feed on healthy and decaying plants. 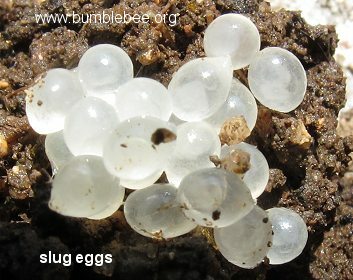 Above is a photograph of some slug eggs I found whilst turning my compost. The eggs are sticky, pearly white, found in clumps, and really very pretty. You can just make out the bodies of the slugs floating in their rich supply of albumin. They are commonly found in compost bins and under plant pot saucers. They need to be in a moist environment to survive. Below is Arion ater, in this species the young are straw coloured, not black. The adults can reach over 20 cm. There is great colour variation in these slugs with the red morph (below left) tending to be found in the south, and some authorities now say that the red slug is a different species and have given it the name of Arion rufus. The photograph on the left was taken in north-east Scotland, whereas the one below that was taken in north-east France. Both are common in ditches and woodland paths. They feed mainly on fungi, but will eat almost anything including carrion and dung. Studies have shown that the dark morph is more common in higher altitudes, lower temperatures and in higher humidity. Arion ater eggs are oval 4 x 5 mm with an opaque shell. They are laid on the ground in clusters of 20 - 50. Eggs and young can survive a hard frost, but adults cannot. 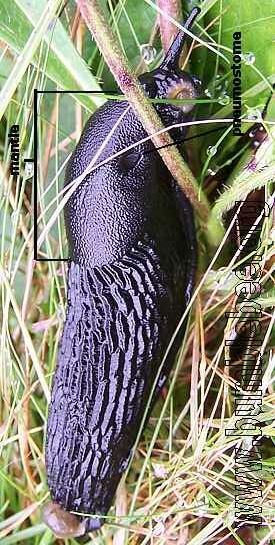 Below is Limax maximus, the great grey slug. Slugs in this genus have their breathing hole (pneumostome) in the rear half of the mantle. The colouring is variable. It can be as long as 20 cm. On the left you can see the keel, that runs up around a third of the body from the tail end. 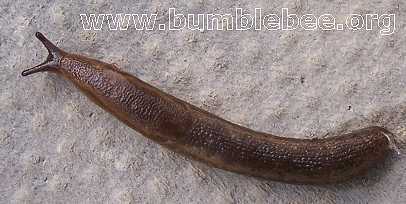 Limax maximus comes out into the open in wet weather, or at night. It has a curious mating ritual. Two slugs circle each other then climb a tree, shrub or some structure where they can crawl out. Then they attach a thread of mucus to the branch or overhang and descend on this thread of mucus to mate in mid air. Once mating has finished both slugs descend to the ground on the mucus thread. Mating tends to take place at night. Eggs can overwinter, but a cold winter will kill adults. Slugs can be reared in plastic boxes if kept damp, and fed on porridge oats, carrots or lettuce.